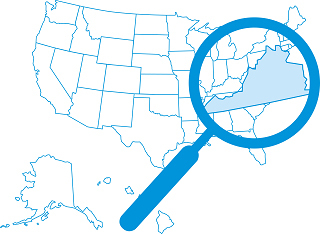 CTI is now highlighting innovative practices in Virginia. Check out the video "Customized Employment" to learn how a partnership between school, DARS, and employment services organization personnel resulted in a job being created for Sean at Barnes and Noble. Spotlight Virginia nominations are now being accepted. For additional information and the nomination form please click here. Troy Carter's story is one of perseverance. As long as he could remember he wanted to attend college. 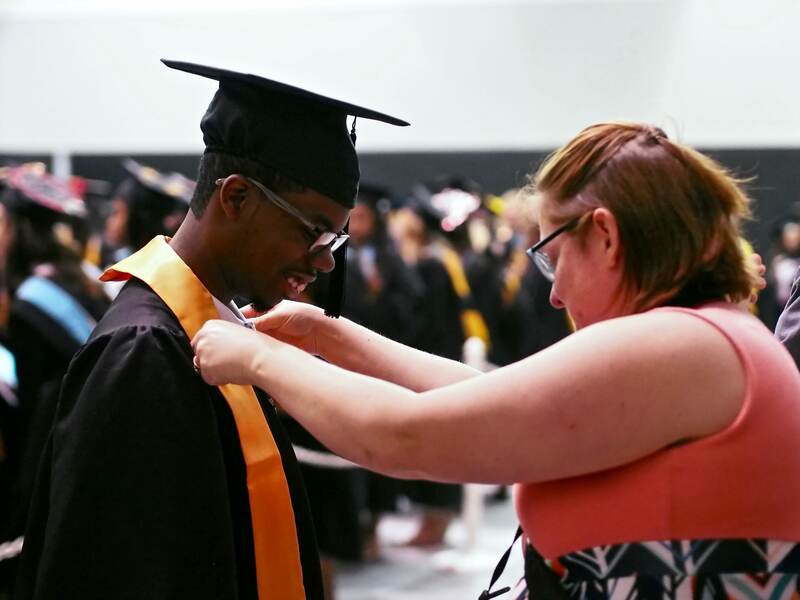 Following high school, he participated in programming at Wilson Workforce and Rehabilitation Center and other job-focused programming, but he still dreamed of attending and finishing a college program. With the assistance of his aunt he discovered VCU's ACE-IT College Program. Troy, a recent graduate of VCU, is now making his mark on the community and country. As a presenter, advocate and role-model, Troy has sought and created opportunity. During his involvement with the VCU ACE-IT in College program he participated in inclusive classes with peers without disabilities. In these classes he's served Richmond's Highland Park community, met L Douglas Wilder, cleaned the James River and modeled the use of assistive technology to actively participate in classes such as Visual Media and Race (AFAM 491). While attending classes Troy also held part-time jobs on campus at the Rehabilitation Research and Training Center and the Office of Continuing and Professional Education. Recently, after completing an internship at the Federal Reserve Bank of Richmond, Troy was hired by the Richmond Region Visitors Center. However, Troy continues to strive for excellence in his quest for independence. He is currently pursuing his driver's license in order to gain independence and flexibility in furthering his career. Troy has also become a sought-after public speaker sharing his story at VCU Open House and serving as mentor and speaker at the MOVE conference that is dedicated to empowering African American males with disabilities to become self-determined and prepared for college and careers. Last summer he was the keynote speaker at the Maryland Inclusive Higher Education Collaborative hosted by Towson University. The group met to develop meaningful college opportunities in Maryland for students with intellectual disability, and in his address Troy shared how others often inadvertently tried to limit his future aspirations to janitorial work. However, he said that VCU has allowed him to find his "true self", someone worthy of respect, friendship and the right to dream big. Following his address, Troy checked into his hotel where the clerk inquired about the reason for Troy's visit as well as his area of study. Troy mentioned his address and that he was "taking African American History." The clerk looked at Troy and said, "M-A-K-I-N-G. You are making African American history, and it is an honor to have you stay at our hotel this evening." Troy's self-advocacy and self-determination, and his efforts and work to expand his voice are paramount in his transition to college and employment. He also greatly benefitted academically and socially from the inclusive general education available to him through ACE-IT. His work skills and employment prospects were also enhanced through his paid employment/work experience during his internship with the Federal Reserve Bank of Richmond. Fairfax County Schools' Secondary Transition to Employment Program (STEP) aims to provide instruction for students who have completed their academic requirements but would benefit from further instruction focused on the employability and independent living skills needed to become productive, engaged citizens in their communities upon graduation. STEP, a postsecondary program, incorporates work-based learning to provide students with relevant, practical experience in entry level employment situations. An instructional component is provided at three Fairfax County schools: Chantilly High School, Mount Vernon High School, and South Lakes High School. The instruction, focusing on work-based learning, increases their readiness for life after graduation. In conjunction with the transition curriculum, students participate in a variety of community based work experiences. Some of the innovative sites where students work include the United States Geological Survey and the Metropolitan Washington Airport Authority at Dulles International Airport. Other sites include hotels, government offices, restaurants, and gyms. Since its inception, 85% of students who exited the program entered directly into paid employment or further career training. Through the STEP Program's instructional and work-based components, students learn and apply several predictors of post-school success including career awareness, community experiences, and paid employment. STEP provides students with career awareness through exposure to careers and helps them to hone their postsecondary goals and as they develop their strengths, interests, and skills and develop attributes outlined in the Fairfax County Public Schools Portrait of a Graduate initiative. The STEP program partners with over 40 businesses to provide community experiences and paid employment to students. Occupational therapy and elementary-age children aren't always associated with transition. That didn't deter Deborah Schwind, an occupational therapist in Loudoun County, from starting the Community Independence Instruction (CII) program at Cedar Lane Elementary School. Third to fifth grade students participate in CII building job skills, developing career interests, and embedding academic knowledge through hands-on learning opportunities throughout the school building. Ms. Schwind recognizes and understands the importance of teaching career and jobs skills early through experiential work-based learning that engages the learner physically and mentally. Through CII, students participate in a school-based Farmer's Market and operate a coffee cart for school employees. Students working on the "farm" cultivate, care for, and harvest the plants. During the spring students grow potatoes, carrots, and sunflowers to sell. During the winter, students grow herbs and then use the herbs to make dressings and vinegars at the Farmer's Market. The winter harvest sometimes includes beets, beet greens, lettuce, kale and radishes. In addition to vegetables, students also sell birdseed wreaths they have made. The coffee cart is one of the year-round businesses run by the students. They stock the cart, make the coffee, collect monies, and provide clean-up. Other work-based learning tasks students engage in through CII include delivering backpacks, stocking sweeteners in the teacher's lounge, assembling nursing bags, and assembling SOL bags. These tasks incorporate movement and heavy work for sensory input. The jobs are part of the student's routine during the day and are included as part of their visual schedule. Students involved in CII coffee cart and Farmer's Market are learning vital Social Skills as they interact with peers in the school, with co-workers, and with a wide array of school personnel. Career Awareness is also developed as students engage in varied job tasks in the farm, Farmer's Market, coffee cart and other school-based work experiences. Four years ago, Linda Dillashaw and Janine Bailey started teaching at Montevideo Middle School and wanted to shake things up a bit. 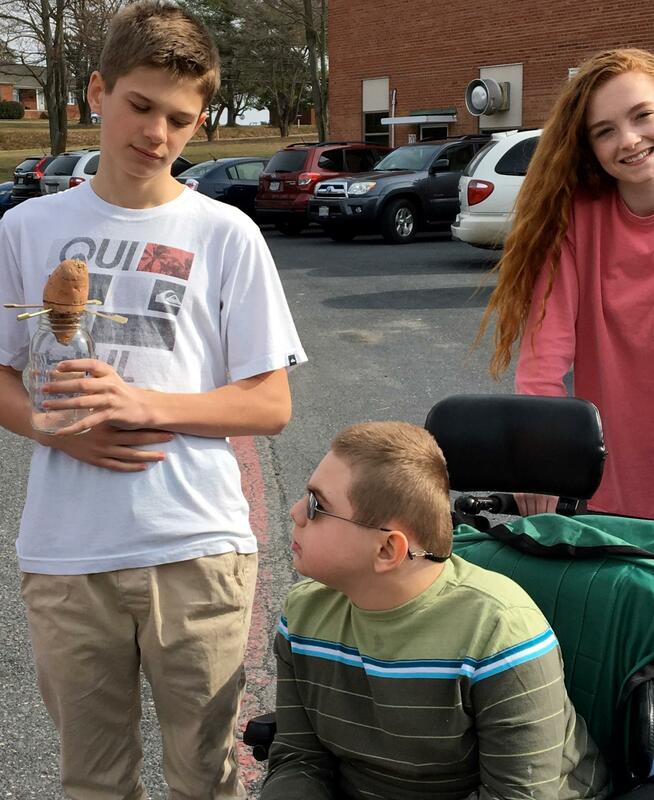 They inherited a long-standing mentoring experience for students with moderate and multiple disabilities that they both thought could take the next step. Taking it to the next step involved not only involving students with disabilities in general education settings, but also adding an educational component for the mentors. Mentors must complete a curriculum that includes coursework on disability awareness, medical terms related to disability, and knowledge on medical and therapeutic devices. This additional information allows mentors to better interact with mentees in general education settings. The accessible bus for field trips is now an inclusive environment with students with multiple disabilities attending grade level field trips with grade level mentors. Peer mentors work on Competent Learner Model goals with students helping to demonstrate goals across environments and with people other than teachers. The course is set up in the course catalog as an elective that prospective mentors choose and, if selected through a competitive process, they are placed with students across general education settings where they will interact with students with intellectual disabilities, autism, and multiple disabilities. The peer mentoring program at Montevideo Middle Schools enhances the school experiences of both mentors and mentees. Peer mentors encourage students to take more ownership of their education by making them feel included and welcome in general education settings increasing Inclusion in General Education settings. The relationship between mentors and mentees involve students working together from the beginning to the end of the school day, including at lunch and in the halls, allowing for many opportunities for students with disabilities to practice their Social Skills. Mentees must also learn to express and communicate their needs and desires with their peers thus increasing Self-Advocacy and Self-Determination. Several years ago, Wise County Public Schools identified that a lack of work experience opportunities hindered skills development and future job opportunities for their students. In response, they developed and implemented Duds and Dough to address a lack of opportunities for students to learn work skills in authentic environments. Duds & Dough offers a consignment shop and catering to the community through a post graduate program providing onsite training to students with disabilities who have completed a high school program. Students work two years in the business and then have the opportunity to work in the community for an additional one to two years under the supervision of a job training coach. Following a student’s work experience in the consignment shop and catering business, they are matched with job offerings in the community linked to their career interests. Students participate in community settings for one to two years before exiting school services. Through work experiences with Duds and Dough students have the opportunity to build pre-employment work and interpersonal skills in two student run enterprises before participating in a supported community-based, paid work experience. They learn valuable social skills through serving and interacting with the customers from the community. They also have a better sense of the types of jobs involved in hospitality and retail work and thus develop deeper career awareness. The Duds and Dough work experience also offers students vocational education and occupational coursework in areas related to retail and hospitality. Students also benefit from paid employment in their community experiences. 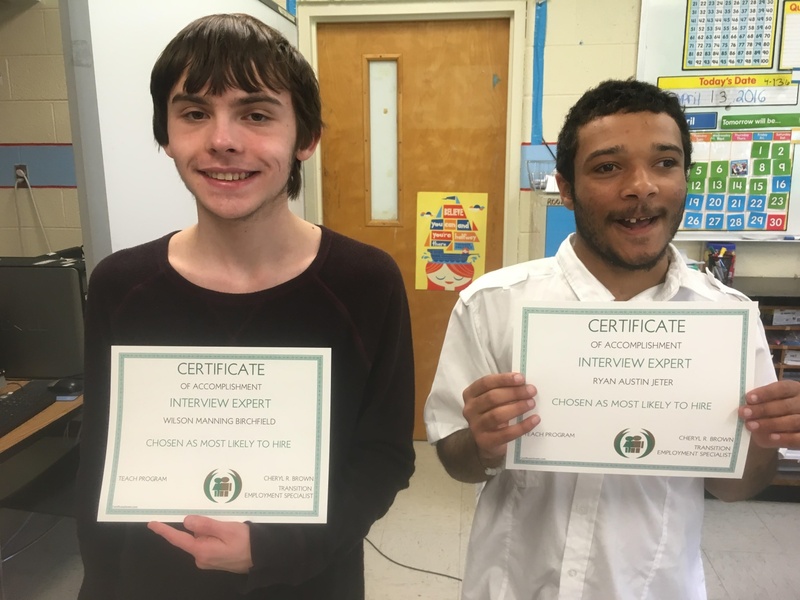 For the past three years, TEACH has provided students with classroom instruction on career preparation topics such as effective communication, listening techniques, self-advocacy, resume building, and job interviewing. Students also participate in internships with seven local businesses throughout the year which provide them with job training and inclusion in the community. Former TEACH students have been hired by participating businesses as a result of their internships. To ensure inclusion of supported employment efforts, career training for TEACH students, and a seamless transition to adult supports, the program partners with the Department of Rehabilitative Services, the Community Services Board, and Career Support Systems. These efforts extend a variety of resources to the students, their parents, and to the community regarding career education and employment of those with disabilities. The program was recently honored by the State Board Association as one of 92 programs across the state "showcased for success." Through the TEACH instructional and internship components, students learn and apply several predictors of post-school success. During the classroom component, students learn valuable self-advocacy, self-care, and social skills. They are then able to apply these skills in employment settings as they work and interact with business leaders and business consumers in the community. They also have a much better idea of the many types of jobs available in their home community as they work in seven local businesses, thus increasing their career awareness as they engage in community experiences. Students also benefit both during school and following high school graduation from the interagency collaboration that is included in the TEACH program. Setting up Situational Assessments – Read more about the steps to set up situational assessments in your community. Since receiving this recognition, Jerziah Melike Moore passed away on December 23, 2016 at MCV Hospital in Richmond, Virginia. He was an amazing young man with special talents in music, art, and drama, and he touched the lives of so many people. We have learned much from Jerziah's time with us here at Children's Hospital of Richmond, Brook Road, and his legacy will never be forgotten. Jerziah is a DJ on the radio, which might not be what you expect from a student receiving school services in a hospital setting. In 2015, Jerziah's teacher Ruth Sangiuliano with Children's Hospital of Richmond took an online course on Transition Outcomes offered through the Center on Transition Innovations. She says this course allowed her "to expand possibilities for Jerziah to include transition assessments that showed areas of interest, learning styles, and provided access to I'm Determined. Jerziah began advocating, not only for his educational and medical needs, but took part in system changes throughout the hospital." Jerziah identified broadcast communication as a future goal, and he now uses his communication device to "DJ" for other children and hospital staff. Jerziah is currently participating in a situational assessment with WRIR radio to present a demo and hopes to eventually work as a DJ for one hour per week. 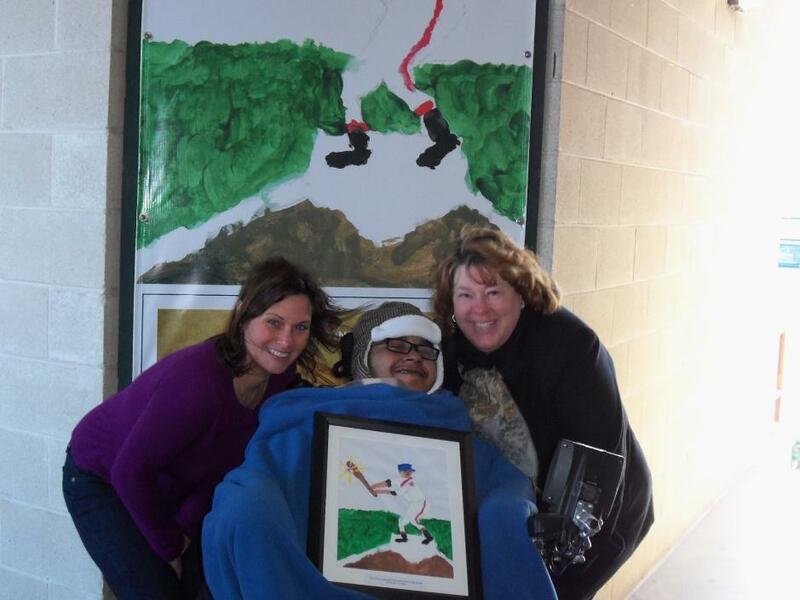 Jerziah has also won awards for his art including the Richmond Squirrels Art Contest in which he designed a baseball player for a mural in the Richmond Baseball Diamond, and the Carytown Art Contest where he placed first for middle school students in Richmond City. Jerziah's experiences have demonstrated a connection to a wide variety of post-school predictors. His experiences with WRIR indicate a strong connection with community experiences and career awareness. Participation in the situational assessment at WRIR is an example of work study as he learns from radio professionals with school support. Additionally, he has learned and practiced many self-advocacy and self-determination skills over the past year. Jerziah uses his skills and experiences to assist other learners by giving demonstrations and telling his story to student nurses from several schools of nursing around the Richmond area. Jerziah is a remarkable example of how transition planning that occurs early in a student's life can lead to opportunities that some may have never thought possible. Friday night lights are becoming more inclusive at one Virginia high school. Cosby High School in Chesterfield County was the first school in Virginia to implement the Sparkle Effect Cheerleading program. Students with disabilities join the varsity cheerleading team at football games to cheer on their team. 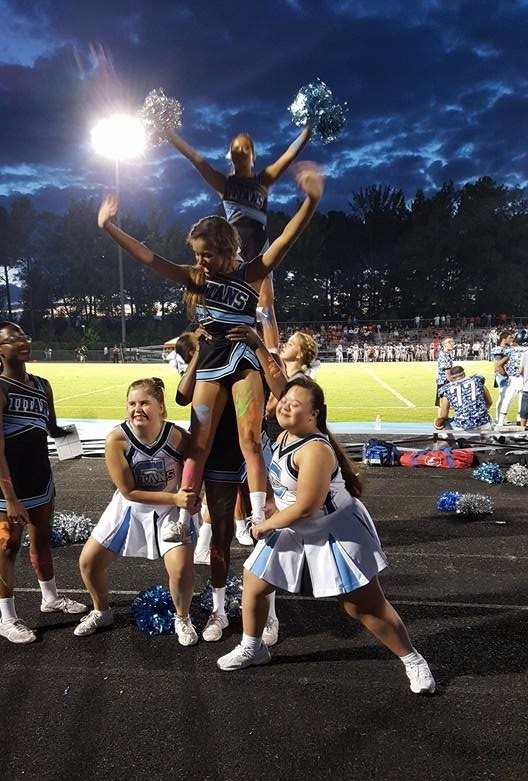 "The Sparkle Effect program is a nationally recognized cheerleading program that invites students with special needs to be part of the action during Friday night lights," explains Megan Deluccia-Chisholm, the varsity cheerleading coach at Cosby. According to the Sparkle Effect website the aim of the program is to "showcase a loud and public symbol of acceptance...changing a school's culture to one that values diversity." Through program participation, Sparkle Effect cheerleaders engage in several predictors of post-school success. First and foremost, they are involved with students without disabilities through inclusion in general education activities. They learn valuable social skills through their interactions with other cheerleaders, sports participants, and spectators. Their self-advocacy and self-determination skills are enhanced as they learn complicated cheers, call and lead cheers, and through increased confidence in their abilities. All of these skills are valuable as they look forward to a life time of participating in inclusive recreation and leisure activities. The Freedom High School Bistro and Bakery is a student-led enterprise serving breakfast and lunch to staff and parents. Students serve breakfast pastries and coffee from 7:30-8:30 each morning and lunch on Tuesday, Wednesday and Thursday. Lunch offerings, prepared by the students, include salad, soups, and desserts. The Freedom Bistro Express started as a simple school bus, but it has been transformed into a food bus. The Bistro Express serves walking tacos, ice cream and drinks to students in afterschool activities and to local construction crews working near the school. The Bistro Express also caters home football games. Students helped transform the bus into a bistro and run all aspects of the business including: menu development, grocery shopping, cost analysis, food prep, money management, and food safety. All profits from both restaurants go toward students' supplies and educational and work-based field trips. Through program instruction and the work-based experience, students working at the Bistro and Bakery and the Bistro Express are able to engage in several predictors of post-school success. They learn valuable social skills through serving and interacting with customers and have a much better idea of the types of jobs involved in restaurant work by developing career awareness. For students interested in working in hospitality and dining services, the Bistro work experience offers them vocational education and occupational coursework.